It is a real delight to meet with Minister again here in London. My warmest welcome to the Jersey business leaders. Last August, I paid my first visit to Jersey. I was deeply impressed by its natural beauty, hospitable people, efficient government service and unique business-friendly environment. During the visit, I reached consensus with Lieutenant-Governor John McColl, Chief Minister Ian Gorst and Minister Sir Bailhache, that the cooperation between China and Jersey will always focus on substance and quality instead of size and quantity. We also achieved many outcomes. Today's forum is one of them. It is a concrete action to turn our consensus into reality. As a Chinese proverb goes, "Contemplating on the river bank will not get you any pearls". I think the Jersey version of this proverb would be, "If you sit on the beach instead of setting the net, you will never catch any fish." Today, the China-Jersey Business Forum is an opportunity to dive into the river and set out to sea. Business leaders from both sides are coming together for in-depth discussions on financial services, tourism, food, logistics and bio-science. These discussions will help us see where China and Jersey can cooperate and what can be achieved. Let our enormous enthusiasm for cooperation lead us to specific and concrete projects. In my view, economic cooperation and trade between China and Jersey is faced with three major opportunities. The first opportunity is the economic new normal in China. · China's High-speed growth is shifting down a gear. · Economic structure continues to upgrade. · Innovation and domestic consumption are replacing production factors, investment and export as key economic drivers. This means steadier economic growth, more diverse economic drivers and more stable development prospects in China. The Chinese market will be more open and dynamic. The Chinese enterprises will become more international. The second opportunity is the continued economic recovery in the UK and Europe as a whole. Both Europe and the UK are big markets for China and important destinations for Chinese investment. Good news of growth in Europe, especially the strong recovery in the UK, no doubt boosts the confidence of the Chinese companies as they decide to put their money here. I am sure that like the warm April weather, the economy of Jersey will warm up amid the recovery in Europe and the UK and will brim with vigor and vitality. 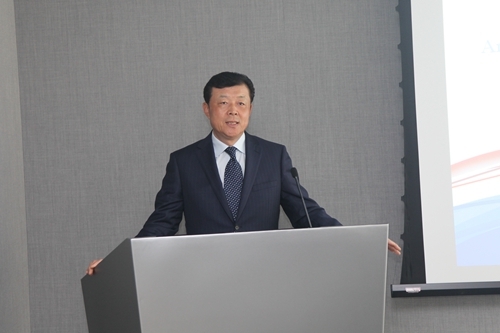 The third opportunity is the golden time of China-UK relationship – an era of comprehensive development. This sound momentum, in my view, will not be affected by the results of the forthcoming election. This is because a strong China-UK relationship is not only the consensus of major political parties here in the UK. It is also the desire of both the Chinese and British people. China is ready to work together with our British friends to continue to achieve new outcomes and new breakthroughs in China-UK relations. In China-UK trade and economic cooperation, there has been gratifying and exciting news. Trade was over 80 billion US dollars last year and continued to grow in the first quarter of this year. 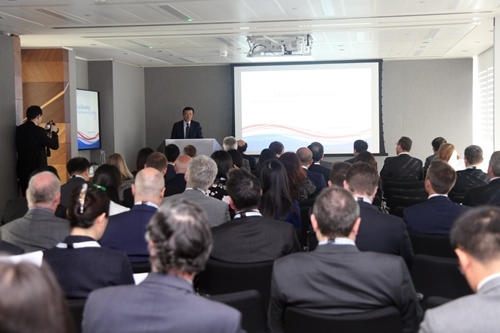 Chinese companies are optimistic about the UK market, having already invested over 1.4 billion US dollars here in the first quarter. Jersey Island has a unique status and a comparative edge in industrial structure. There is no question Jersey will play a significant role in the overall relationship between China and the UK as well as bilateral trade and economic cooperation. "Short steps add up to thousands of miles. Small trickles join together to fill vast oceans." Let us work together to push for all-round exchanges and cooperation between China and Jersey Island. Let us make our mark in China-UK cooperation. Let us lend a hand and cheer for China-UK relations. 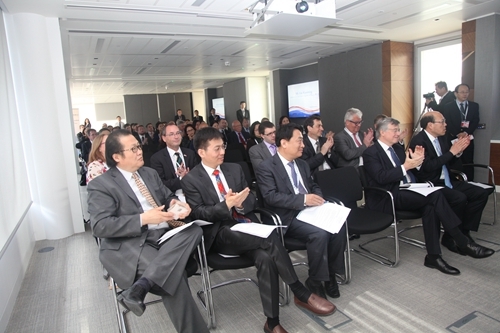 In conclusion, I wish CEAB China-Jersey Business Forum complete success.